Distinguishing matter and not matter: Do children think solids, liquids, and gases belong together? Do young children have an abstract concept of matter? If so, what do students initially think matter is? What properties do they focus on as important? Does their concept of matter allow them to realize that solids, liquids, and gases are made of the same building blocks? In one interview task, students sort 14 entities (i.e., wood, ice, dog, mosquito, sand, milk, water, air, steam, smoke, heat, shadow, light, dream, presented as words on cards) according to whether they are matter or not. They place those objects about which they are unsure in a third pile. Finally, they explain their reasoning and consider whether there are ways the items in the matter or not-matter piles are all alike. Early on in grade three students almost never think to group all solids, liquids and gases together while also excluding non-material entities (e.g. dreams, shadows). (Actually, only one child classified objects in such a way!) Nor did they distinguish material from immaterial objects on the basis of having weight, taking up space, or being composed of atoms and molecules. Some students regard only a subset of material items as matter (typically, solid, liquid, and granular materials, but not air, steam, or smoke). They seem to reserve the term matter for objects that can be seen, felt, and touched. Other students correctly include gases as well as solids and liquids in their groupings, but then overextend the concept to include non-material physical entities such as heat or light as well. Both patterns, while noncanonical, are signs that children are developing a precursor concept to the scientific concept of matter. At the start of grade 3, however, approximately half of the students created idiosyncratic and (to us) incoherent matter groupings (groupings that simultaneously excluded some material entities such as water, air, or sand while including some non-material entities such as heat, light, or shadow). In explaining their groupings, they commonly appealed to irrelevant attributes, for example, whether something is important, natural or man-made, or whether they knew what it came from (e.g., water isn’t matter because it doesn’t come from anything else) or how it was made (e.g., shadows are matter because they are made from light and people). These children do not yet appear to have even a precursor concept of matter. By the end of Grades 3 and 4, Treatment students had made significant progress in their understanding of matter by moving from incoherent patterns to patterns that reveal a precursor concept of matter. In contrast, there was no significant change in the understanding of Control students from grade 3 to 4, with idiosyncratic and incoherent patterns still quite common. We will be interested to see if the Treatment students continue to improve in Grade 5, by moving toward a more canonical concept of matter in which they recognize that gases as well as solids and liquids are matter and that all matter takes up space and has weight, and whether the significant differences between Treatment and Control students are maintained. Understanding materials as underlying constituents with invariant properties: Is sawdust wood? Will it burn? A related question concerns how students conceptualize specific materials. For example, do they understand that grinding a material into a powder will affect the appearance (look and feel) of a material, without changing its identity or distinguishing physical properties? Recognizing that materials retain their identity and (some non-perceptual) properties with physical decomposition is central to their developing a more general (abstract) concept of matter in which materials are understood as underlying constituents of objects. It also strengthens their understanding of the deep similarities among solids, powders and liquids as the same material can be in all three forms. To assess children’s understanding of these issues, children witnessed physical transformations (grinding, melting) and were asked whether the post-transformation state of wood, iron, and butter was the same kind of material as before the transformation. Is it still wood after grinding? Is it still iron after filing? Is it still butter after melting? Would it (the sawdust) still burn? Would the black filings be attracted to a magnet as the iron bar was? Figure 1. 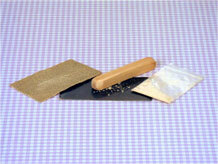 Stimuli used with children in questions about the effects of sanding on wood. Children use sandpaper on a piece of wood, are told that what was in the bag came from rubbing the wood with sandpaper, and then are asked (of the stuff in the bag): Is it still wood? Is it still the same kind of stuff? Will it burn? At the beginning of 3rd grade, over half of the Treatment students consistently judged that the sawdust was still wood, the black filings still iron, and the runny liquid, still butter; the remaining children were less consistent. They had more difficulty, however, in consistently using knowledge of material identity in making inferences about (non-perceptual) properties. For example, although 64% said the sawdust was both wood, and the same kind of stuff, only 38% went on to say that the sawdust would burn. By the end of both 3rd and 4th grade, almost all the Treatment students were consistently reasoning that grinding and melting didn’t change material identity; the majority now also correctly believed that the little pieces would have some of the same properties as the big piece. The 3rd grade Inquiry curriculum appeared to have facilitated the development of these understandings among children; however, by 4th grade, these understandings were also quite strong among the Control students as well.